How Hard Is It to Quit Bath Salts? Bath salts are synthetic drugs with effects similar to other stimulant substances such as amphetamines and cocaine. They are addictive and can be difficult to stop using without some kind of formal treatment. Bath salts are synthetic substances that are chemically related to cathinone, a stimulant found in the khat plant. However, synthetic cathinone is much stronger than the organic compounds found in khat. The drugs have a potential for abuse and addiction, and people often abuse them with other drugs. 5 Regular users may build a tolerance to bath salts, increasing the amount used over time and, eventually, continuing to compulsively use them even if their use is causing problems to their health or relationships. Improved functioning. People who quit using bath salts are more likely to perform better at a job or at school because they are not under the influence, recovering from drug use or seeking drugs. Reduced risk of accidents or personal harm. Bath salts can cause behavior in users that can lead to encounters with law enforcement or harm to themselves or others. Users have experienced hallucinations, paranoia, panic attacks and extreme aggression while taking the substance. Better relationships. Any addiction takes a toll on relationships with friends and loved ones. Quitting bath salts allows users to reconnect with people in their lives and mend any harm the addiction has caused to these relationships. It is possible to stop using bath salts on your own. But the cravings that accompany bath salts withdrawal can be quite severe. Many people give in to these cravings and relapse without the supportive environment provided by a treatment program. Inpatient treatment provides those seeking recovery from substance abuse with an opportunity to stay in a drug-free environment that includes the support of therapists, nurses and physicians. Inpatient programs typically provide mental health treatment, routine nursing care, numerous groups throughout the day to help build skills to resist relapse, and recreational activities. Outpatient treatment typically involves therapy sessions once or several times a week. Therapy groups are similar to those in inpatient treatment. Outpatient treatment does not provide the 24-hour supportive environment of inpatient treatment, however, so it may not be the best option for those who are addicted to multiple drugs or have a particularly severe addiction. A treatment specialist can determine which type of setting is best for an individual after careful evaluation of all the factors involved. Individual therapy is widely used in addiction treatment programs. The most commonly used therapy for addiction is cognitive behavioral therapy. This approach focuses on identifying thinking patterns that lead to drug use. Interventions are designed to stop these thinking patterns and help the person learn new, more productive ones. New behaviors can then result from new ways of thinking. Teen substance abuse programs are designed specifically to help adolescents who are struggling with addiction. They often include individual and group therapy, but the groups are focused on issues specific to teens, such as peer pressure, body image, and self-esteem. Multidimensional family therapy is an approach often used with adolescents in drug treatment programs. 4 It helps their families work with the adolescents and accommodate their needs for structure and support during the recovery process. 12-step meetings are free to attend and exist in almost all communities. They are a place where people seeking recovery can receive support from others battling addiction and offer feedback. Narcotics Anonymous (NA) is one such 12-step program that some bath salts users may find helpful. In addition to 12-step programs, other types of groups can provide support for those in recovery from addiction to drugs such as bath salts. These include community groups run by churches, community centers and private counseling centers. Aftercare is important after leaving a rehabilitation program for bath salts addiction. People in recovery can continue to receive support from a therapist, sponsor or other members of the recovery community. This support is critical in preventing a relapse. Individual or group counseling. 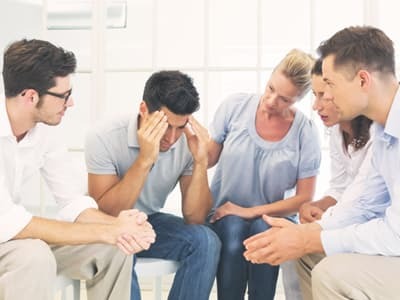 Meeting regularly with a therapist in a one-on-one or group setting offers the opportunity to discuss challenges to recovery and continue to refine coping and relapse prevention skills. 12-step programs. Many people choose to attend 12-step meetings for years after completing a rehab program because of the support and encouragement the environment offers. Non-12-step support groups. Alternative support groups to the 12-step approach include SMART Recovery, Secular Organizations for Sobriety and Women for Sobriety. These programs use a secular approach that focuses on self-empowerment and evidence-based treatments. Sober living arrangements. Sober living homes, or halfway houses, are group homes that allow recovering users to live in a substance-free atmosphere. Residents can conduct a job search, go to school, and make other steps to move forward with their lives while receiving counseling or attending support group meetings. Withdrawal symptoms include depression, tremors, problems sleeping and paranoia. The severity of withdrawal can vary and depends on many individual factors, such as the length of time a person was addicted to bath salts, the severity of the addiction, and whether they were dependent on other drugs. The depression some users experience when withdrawing from bath salts can sometimes be severe enough to trigger suicidal thoughts and actions. It is best when quitting bath salts to undergo a program of medically supervised withdrawal. Are You Ready to Quit Bath Salts? Who Answers? to speak to a recovery support advisor about getting into a program today. Get professional treatment. It can be very difficult to quit bath salts by yourself, and a recovery program can offer professional staff to help you uncover the root causes of your addiction and provide any medical care or medication needed. Know your triggers and avoid them. Triggers are people, places, or things that can cause recovering users to crave bath salts. A therapist can help you identify your triggers and teach you techniques to avoid and cope with them. Develop healthy habits. Eating a healthy and balanced diet, getting enough sleep and exercising regularly can help your body recover from the effects of substance abuse and make you less likely to crave drugs. Build a support network. Make an effort to spend more time with friends and family who do not use drugs, and avoid old friends you used bath salts with. Associating with drug users can trigger cravings and relapse. Participate in an aftercare program. As mentioned earlier, aftercare programs such as 12-step meetings and ongoing therapy are crucial to staying sober and preventing isolation. Don’t threaten or blame them for their addiction. This will likely make them angry or upset and could drive them to continue to use. Tell them you’ll support their recovery and offer treatment options. Research treatment programs in your area that help people with bath salts or stimulant addiction, and be prepared to present these to the person. Be ready to make several attempts to help. Many people who are addicted have a hard time admitting that they have a problem and become defensive when confronted about it. You may have to approach them a few times before they’re ready to admit they need help. Consider an intervention. Interventions are an optionif the person continues to refuse treatment. However, they can be risky. Enlisting the services of a professional interventionist may increase the chances of success. Bath salts – and other stimulant drugs – are not easy to quit using. Relapse rates are high. Bath salts can trigger intense cravings in users,1,5 and withdrawal can produce symptoms of anxiety, depression, sleep disturbances, paranoia and tremors. 2 The cravings, combined with the withdrawal symptoms, can make it extremely difficult to get through the early stages of recovery. These unpleasant and potentially dangerous side effects should be managed in a detox or recovery program to ensure the best possible outcome. Additionally, quitting bath salts alone does not help the person who is addicted understand the reasons behind the addiction, such as stress, trauma or a mental health problem. These issues should be understood and processed in therapy. Otherwise, the individual is likely to use again to cope with these underlying problems. If you or your loved one is ready to get help for a bath salts addiction, call one of our treatment support representatives today at 1-888-319-2606 Who Answers? . You can receive treatment options based on your insurance coverage. If you don’t have health insurance, get referrals to low-cost programs or support groups in your area by calling the Substance Abuse and Mental Health Services Administration’s (SAMHSA) helpline at 800-662-HELP (4357).
. National Institute on Drug Abuse (2016). Drug Facts: Synthetic Cathinones.
. Substance Abuse and Mental Health Services Administration. Report shows “bath salts” drugs were involved in nearly 23,000 emergency room visits in one year. Press release, September 17, 2013.
. Substance Abuse and Mental Health Services Administration (SAMHSA) Center for Substance Abuse Treatment. (2005) (Treatment Improvement Protocol (TIP) Series, No. 41.) 1 Groups and Substance Abuse Treatment.
. Prosser, J. (2012). The Toxicology of Bath Salts: A Review of Synthetic Cathinones. Journal of Medical Toxicology 8(1): 33-42.